A-5SW. A-Frame Sidewalk Board. 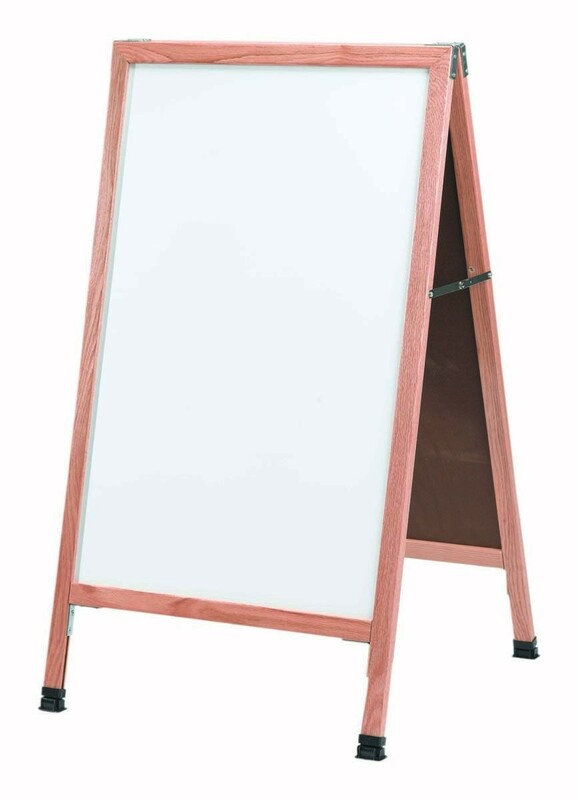 A-Frame Sidewalk Board Features a White Porcelain Markerboard and Solid Red Oak Frame with a Clear Lacquer Finish. Size 42"Hx24"W A-Frame Sidewalk Boards make great Menu Boards or POP signs that broadcast messages effectively. Great for restaurants, pubs, markets and retail stores. Frame is solid oak with a clear lacquer finish surrounding a White Porcelain Markerboard. Size 42"Hx24"W. Steel Reinforced Corners Weather Resistant Hardware Unique Plastic Camel Foot Floor Leveling System Full Width Aluminum Hinges .